Recovering from issues such as accidentally deleting files or overwriting important configuration files can be very cumbersome, especially when you are the storage or virtualization administrator in a larger company. In most cases this will require the assistance of the backup or virtualization administration, who potentially doesn't even work in the same team as you, and getting a response can take hours or days. The way this typically works is that the application admin requests a recovery from the virtualization admin, who has to restore an older snapshot and restore this entire snapshot as a new VM. Then the virtualization admin grants VM-level access to the app admin who can now recover his files. Once the app admin is done, he has to notify the virtualization admin again that the recovery is complete and that the restored Virtual Machine can be recycled. 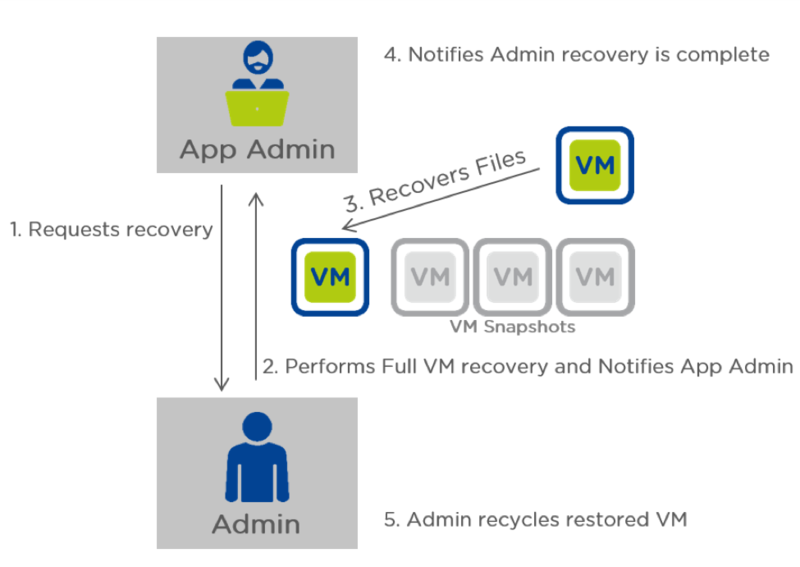 With the release of Nutanix 4.6, the application administrator is now empowered to recover files through a powerful self service feature, creatively called Nutanix Self Service Restore (SSR). The Nutanix admin can enable SSR on a per-VM basis, and thus can give the power of self-service to the app admins he trusts. Once enabled the app admin can easily manage snapshots from within the VM: list available snapshots, and mount or unmount a particular snapshot. Once a snapshot is mounted, it will show up as a new drive in the Windows guest OS, the admin can copy out the required files and then can unmount the snapshot. If the admin forgets to unmount, it will automatically get cleaned up after 24 hours to avoid mounted snapshot congestion. The admin of course can connect multiple snapshots to his VM at the same time, in case he needs to search back in the snapshot history. The Self Service functionality requires the Nutanix Guest Tools (NGT) to be installed within the guest OS - a new component in the Nutanix product that is responsible for tasks such as securely communicating with the Nutanix CVM from within the guest for control plane operations, handling disk signature clashing, and hiding any system-reserved partitions. SSR is fully supported on both the VMware vSphere hypervisor as well as the Nutanix AHV hypervisor. Virtual machines that have vSphere snapshots (i.e. vSphere Delta disks) are not supported at this time. This just the beginning and represents a promising direction of empowering app admins with even more capabilities. Of course, this feature is not meant to replace full-fledged backup solutions that offer functionality like catalog management, object level restore and external backup locations, such as from our valuable partner Commvault. For customers who are looking for a VM and file level restore backup option, this may fit the bill - especially SMB and ROBO customers who are cost conscious. With the added Self Service Restore capabilities, Nutanix once again enhances the value of the only hyper-converged solution that provides compute, storage, and virtualization capabilities, now with backup and restore capabilities driven by the application admin himself! Stay tuned for more news and feel free to reach out to us at @Nutanix or me personally @MarkNijmeijerCA if you have questions or feedback on this or other data protection and disaster recovery related features. Also, continue the conversation on the Nutanix NEXT community.